GEA homogenisers are used in pharmaceutical and cosmetic applications and have been achieving excellent results in terms of cell disruption and emulsifying effects for many years. With the NiSoX-Valve, GEA has changed the homogenisation process for processing micro- and nano-emulsions for the chemical, pharmaceutical and cosmetics industries. Following up on GEA’s presentation of this innovation at Achema 2018, the results of the first field study undertaken at a customer site are being made available now prior to Powtech 2019: “After testing in our Process Technology Centre in Parma we stress-tested this technology in a real application for the first time. And we’re pleased that we were even able to exceed our original laboratory results,” states Kai Becker, Head of Product Group Management Homogenisation at GEA. “We have succeeded in producing a nearly transparent emulsion.” The new NiSoX-Valve geometry optimises energy distribution during homogenisation, thereby reducing particle size and significantly improving the homogenization effect. Since 2018, GEA and its customer have been testing the new process intensively using the NiSoX-Valve in production to demonstrate the reduction of particle sizes and uniform particle distribution. In the field study, the emulsion formulation consisted of water (80%), fat phase (15%) and surfactant (5%). The practical tests confirm that the polydispersity index is lower than that of conventional valves, especially for applications in the high pressure range from 700 to 1,500 bar. This improves physical and visual properties such as viscosity, transparency and gloss – all very desirable in the processing of pharmaceutical and cosmetic nanoemulsions. NiSoX leads to near transparent emulsions. 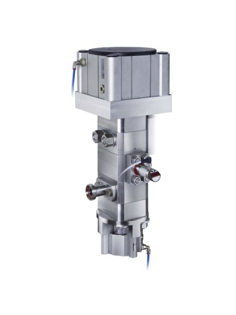 Previously, homogenising valves were designed to minimise the distance between the passage head and the impact head to achieve the required micronisation of the particles. However, the NiSoX-Valve reverses this principle: in contrast to the standard process, GEA does not press the medium to be emulsified into an annular gap – but rather out of it. This results in much better particle distribution, higher dilution and reduction in the cohesive forces. The medium then collides radially in the chamber of the CCMS (Cavitation Cloud Modulating System). The imploding gas bubbles in the adjustable cloud cavitation can therefore more easily micronize the particles. Matteo Folezzani, Mechanical Engineer in the Product Development for Homogenisation at GEA, explains the innovative technology: “We’ve leveraged the fluid dynamic effects that happen within the NiSoX-Valve which means we are now able to control the effectiveness and efficiency by moving what we call the cavitation cloud. It can be adjusted according to the product being processed and the specific inlet conditions.” In addition, there is a second effect: Manufacturers need fewer batch circulations to achieve the desired result. Likewise, the number of passages at a given pressure can be reduced.